The Sampled-Audio functions part of Syntherella provides a possibility to create specific wave forms that are played by the built-in speaker of a computer. By this it is possible to explore the interrelations of mathematics and the very fundamental structures of sound. Syntherella provides essentially three specialized functions that cover different scenarios. playfunction(...) allows to form a sound wave by specifying its underlying function. playlist(...) plays a sound specified by a list of samples that specify the wave. 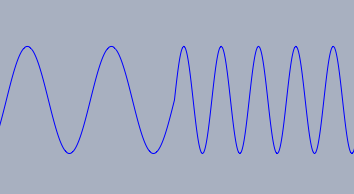 playsin(...) plays a sin(x) wave with specified frequency. Harmonics can also be specified. Before we will describe these statements in detail we will give a brief explanation (in a nutshell) of these statements and the subtleties that are relevant for the generation of an audio signal. starts to play a first tone with 440Hz, after 0.2 seconds replaces it with another tone of 550Hz and after another 0.2 starts another tone that is played for a full second. There is one more subtlety that is also resolved by the line modifier. When one tone is replaced by another you may a priori not take it for granted that the new tones starts in reasonable phase position relative to the first one. The line modifier takes care of this issue automatically. Rather than simply replacing one wave by another, it changes the timing of the underlying waves. It even goes one step further and makes a smooth transition between the two frequencies. The differences are shown in the images below. 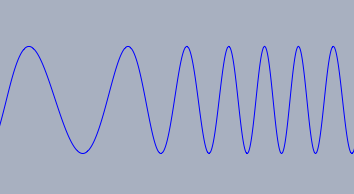 Description: In its simplest form this operator plays the sound of a sine wave with constant amplitude and duration of one second. The duration, amplitude and sound characteristics can be altered by suitable modifiers. Modifiers: The command has several modifiers. Again this will be exponentially damped. Description: Takes a function as input and interpretes it as a wave form. The time unit is such that one unit in the function correspond to one second. 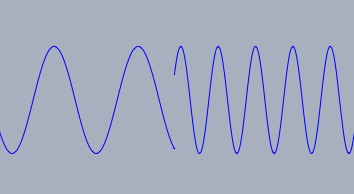 Examples: The following piece of code produces a sine wave of 440Hz. The following piece of code produces an exponentially damped noise signal. By specifying start and stop one can exactly determine the region of a function that is used for a sound sample. This region may even be very short. Using the duration modifier one can force that the sample is played over and over. Thi following piece of code samples exactly one sine wave and plays it over and over for one second. The data generated by the function sampling can also be exported to an array. The sample rate is 44100 samples per second. The exporting can even be done silently. For instance, the following code creates a list of 44 sample points of a sine wave. Description: This statement creates a sound that is driven by a list that contains sample data. The vales of the samples are assumed to lie in the range -1.0...1.0. The sample rate is 44100 samples per second. Usually the sample is played over and over for one second. The play time may be modified by the duration modifier. Example: The following piece of code produces three samples that are played by the playwave operator. Although an explicit duration is given after the time specified in the wait each sample is replace by the next one since all samples use the same line. Before the playwave function proceeds to the next sample it is made sure that the actual sample was completed. Description: This statement immediately terminates all sampled sound audio. Contributors to this page: Kortenkamp , Richter and admin . Page last modified on Friday 02 of September, 2011 [16:47:48 UTC] by Kortenkamp.